Home » Featured » #DREAMSCOMETRUE: GET PUBLISHED IN 2017! Writers: we are currently accepting submissions in all genres for 2017 publication! Make 2017 the year you take your dream and make it a reality by publishing with Cavern of Dreams Publishing! Based in Brantford, ON, we are proud to offer personalized editing and publishing services, working closely with all our authors to ensure that their dream – their published book – is professional, polished, and something they can be proud of! We currently represent 13 authors with a combined 37 publications, with many more coming in 2017! You can check out our the great services we offer HERE, and when you’re ready to take the next step, our submission guidelines HERE. And of course you can always contact us HERE with questions or to discuss your project personally with a CODP representative. 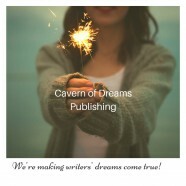 At Cavern of Dreams Publishing, we have been making writers’ dreams of becoming published authors a reality since 1998. Let us help make your dream come true next.